Clare comes to the Viewpoint team with over 5 years optical experience under her belt. She’s won numerous customer service accolades while working in Georgia, Colorado, Ohio, and Illinois before finding her way to the Sacramento area last summer. 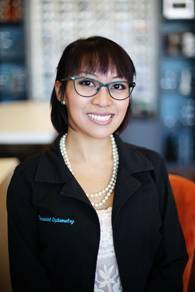 Her favorite aspect of her job is matching a patient’s unique personality with fashionable eyewear and utilizing lifestyle to fit lenses that will provide the best vision. She provides attentive and caring service, always ensuring patients are comfortable at every stage of their visit. On her off days Clare enjoys adventuring with her husband and toddler daughter, crafting activities, baking goodies and feeding people whenever she can.